What is Light Weight Thermal Paper or 48 gram Thermal Paper? Light weight thermal paper or 48 gram thermal paper refers to a direct thermal paper stock that has a 48 gram basis weight. This paper grade is sometimes referred to as economy thermal, hi-yield thermal, 2.1 caliper thermal or simplicity 48 thermal. 48 gram thermal paper was introduced back in the early to mid 2000’s. The industry started to shift from 55 gram (2.3 mil) thermal to the 48 gram (2.1 mil) thermal paper when the major thermal printer OEM’s including IBM and Epson found there was no down side to the printers output or speed. 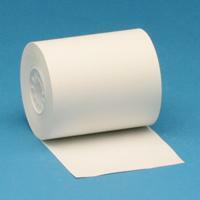 What are the benefits of the 48 gram thermal roll paper? • 10% more paper per master roll or small converted roll: For example, a 3.0” OD roll could now hold 273’ vs. the max of 230’ of the 53-55 gram base weight. • Fewer roll changes: The higher yield of paper means you have to change the roll less often. What applications are a good fit for the 48 gram thermal paper? 48 gram thermal paper is best used in general point of sale receipt applications where the paper grade has been approved by the printer OEM and the paper will fit the application requirements. These applications generally don’t require any special image life, sensitivity, heat resistance, premium feel, image protection, paper thickness (caliper) or other specific requirements.